Click the button below to add the Aprilaire Model 700 Whole House Humidifier to your wish list. The Aprilaire Model 700 Whole-House Humidifier features truly automatic control, so there's never a need to manually control the humidifier—though it can be installed in manual mode, if desired. Please be aware that the model code 700A is no longer used. Aprilaire has renamed the unit to 700. 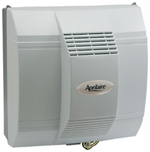 The new Aprilaire 700 Whole-House Bypass humidifier replaces the older 700A. The 700A is no longer available. * The 700 is for vertical use ONLY. This unit can NOT be used with horizontal applications. 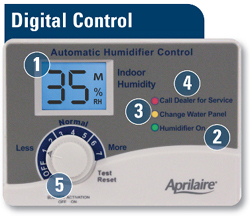 The Digital Control provides accurate information and automatically delivers proper humidity levels continually; regardless of temperature or conditions. Know your relative humidity - Backlit display provides the current humidity level in your home. Know when your system is running - The green light clearly indicates that your humidifier is up, running and protecting your home, comfort and health. Know when to replace the water panel - The "smart" feature measures usage of your water panel, rather than simply relying on the calendar. The yellow light lets you know when it's time for replacement. Know immediately when service is needed - In the unlikely event that there is a issue the red clearly indicates that there is a problem, while the digital display provides the service code that your dealer can use to isolate the problem saving time and money. The Wholesale Wharehouse has the best pricing for this humidifier!! I installed it myself and it was pretty easy, if you can follow directions anyone can do it. It uses way less water then the one on my old heating system. I would recommend this to anyone who's in the market for one.